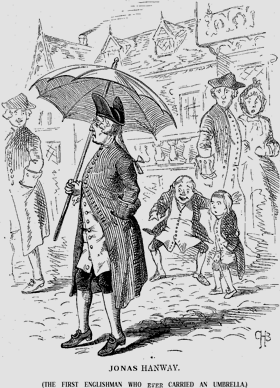 In October of 1750, Englishman Jonas Hanway had the nerve to walk through the streets of London carrying an umbrella. To be clear this was well before the umbrella became the preferred mode of transportation for magical English nannies. Though the umbrella had been introduced through much of Europe at the time, it’s most notable use was as a favorite accessory of the more fashionable ladies of France. Anything that can be referred to as a bumbershoot is probably a little funny anyway. And it certainly doesn’t take much imagination to conclude that an otherwise well-respected Englishman walking down the street sporting the latest in 18th century French ladies’ fashion might draw some attention and (possibly deserved) ridicule. But why would someone carrying an umbrella in 21st century Oregon deserve a similar reaction? When we relocated to Salem, Oregon a few years ago, we knew that with a 2000 plus mile relocation would come a few small cultural differences. We expected that we might pick up a few new bits of slang in our vocabulary, learn some variations on well-known songs, and maybe stumble on the recipes of some local specialties. One thing that did surprise me, though, was when I was warned that in this region in which it rains pretty much from November to July, I could expect to be mocked if I used an umbrella. It made a sort of sense, I suppose. Salem rain most often consists of tiny little droplets that swirl around in the air and are more likely to coat than douse and so are difficult to stop with a traditional umbrella. Still, even when the rain came down harder, more similar to the sheets that fall in the Midwestern springtime, the Oregonians merely pulled their rain jackets tighter, and ran a little faster. Few were willing to take a cue from 18th century French ladies’ fashion. Or common sense. So now I’m back in St. Louis and it’s April, which means it is storming. The rain comes down in sheets (like rain is supposed to) and when I venture out (and I’m not cowering in my basement under a tornado warning) I carry an umbrella. Because it’s the sensible thing to do. It would have been the sensible thing to do in Oregon as well, but I am sad to say I wasn’t bold enough. When the rain came down in sheets, I pretended to be a native Oregonian and simply pulled my rain jacket a little tighter and ran a little faster. As for Jonas Hanway, he stayed the course, determined that the umbrella (used by many ancient civilizations) was a sensible and worthwhile idea. Come rain or come shine, he stubbornly carried his favorite and slightly silly-looking accessory through the city streets for nearly thirty years. 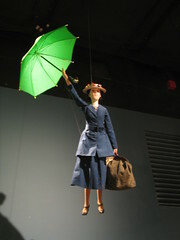 Eventually the idea caught on and soon enough the men and women of London began carrying umbrellas (for a long time referred to as “hanways”), though it would still be a few years before the bumbershoot would catch on with practically perfect nannies. Who says spaghetti doesn’t grow on trees? I do have to point out that in the Northwest when it is raining hard enough to use an umbrella, the wind is usually blowing hard enough to make an umbrella useless anyway. Good point. I don’t remember a great deal of wind in the Salem area, maybe because it’s so valley-ish? Still, I will concede that umbrellas and wind don’t mix well, unless you really are trying to fly like Mary Poppins. Ah, your response to Oregon rain and umbrellas is much like mine. I would add that one thing I miss here in Oregon is the enjoyment of a booming thunderstorm. Doesn’t thunder much here, as you know, because we seldom have lightning storms–unless you’re up in the mountains. I’d sometimes heard that lightning activates ions in the air to “fertilize” nitrogen onto the Oklahoma prairie, where I grew up. Never did check it out; I’m sure you have an answer. The sound of thunder always topped my list of things I missed about the Midwest. Fortunately the Missouri spring has not disappointed. Though I appreciate your confidence in me, I’m afraid I don’t know about lightning’s effect on the nitrogen levels of the prairie. I never studied that in a chemistry class and despite my Grandmother’s wishes, I neither became nor married a farmer.